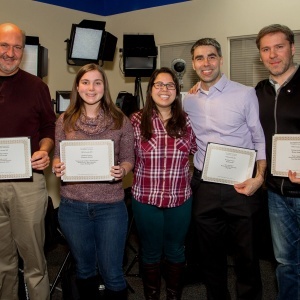 On Monday evening, JPod Films was honored to win a New England VISTA award for the fourth consecutive year. The Boston wedding film Jen + Brandon was given the Gold Award in the ‘full wedding’ category. This was the highest honor JPod Films has received in the wedding film category. The category is one that best fits our most popular wedding film investment. Each year, the New England Professional Videographer’s Association (NPVA) holds the awards in March to honor the best films in New England over the past year. Jen + Brandon’s wedding was filmed in the heart of Boston at the Museum of Science, with the preparations take place at the chic Ames Hotel on Court Street. The intimate wedding included a duck boat ride for all of the guests and a tremendous photo session that ended the day instead of beginning it. The NPVA offers a fabulous outlet for JPod Films to improve our craft with many of the other best professional cinematographers in New England. See Jen + Brandon’s full film below. What do you get your wife for her 40th birthday? For Brendan O’Leary, the answer was simple. A family film featuring his two children served as the perfect surprise for his wife Trystan.